Express your love to your love ones on this Valentine's Day with roses and chocolates!! Red roses proclaim "I Love You." They are the ultimate symbol of romantic love and enduring passion. And of course the heart shape chocolate, represents your heart to your loved ones!! 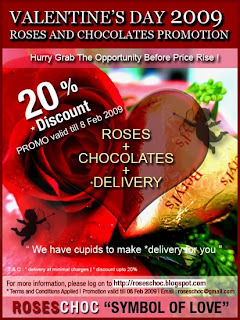 Now ROSESCHOC brings to you good quality branded chocolate and imported big roses to your love one. We also provide delivery service to the locations below. ( refer to the payment mode below). Early birds can enjoy our promotion that upto 20% DISCOUNT. Please do not hesitate and ORDER now. * Early birds promo will be until 8th February 2009. For early birds please Maybank2u the payment to us before 9th February 2009 to confirm your order. Thank you.